Its the season of flash floods for more reasons than one. First off, the east coast received three flash flood warnings in the last 24 hours. As the clouds thickened the heavens opened up and poured. We were instantly inundated with several inches of rain this weekend alone. Happily there were only a few downed trees in our neighborhood as we had virtually no wind to rock and shake less limber branches. The city and residents were at the ready as they prepared for this activity a year ago cutting down old trees and trimming many others. The drainage pipes were replaced in a very timely manner while others were cleared. It's a good idea when getting flood alerts to park your cars where fewer trees grow. Waterproof your basements in advance and have your roof drains cleared periodically. Test the sump-pump regularly. Avoid putting stacks of books and magazines or anything that can get water damaged on ground level floors or near windows that are usually left open for ventilation. Replace damaged electrical cords immediately. Unplug floor fans with metallic bases. Speaking of flash floods, this is also the season for a flood of family and community celebrations including graduations, reunions, carnivals and street parties. Brenda and I were inundated with graduation party invitations this year. Were we prepared for the influx of graduation ceremonies, parties and there was lot's of gift giving. Having received the invitations well in advance we were able to make the most of it. It was a great time to commend our young ones for setting realistic goals and reaching them, as well as affirming our support. My younger brother Terence and his wife presented a well catered event in the park. It was a warm sunny day and large family groups were celebrating graduation everywhere. In came family members who drove over 4 hours to congratulate the graduate, our nephew. The next day our hard working cousins LaTavia and her mom did a great job providing creative games and activities. Even though I was just an observer we were well entertained watching the graduates pulling off some very comical stunts to win the game. It was a two-day family reunion under a graduation theme. To our surprise we saw many childhood friends and former school-mates we hadn't seen since our own graduation days. It was a time to remember the highlights of our generations and some really good times. The unexpected surprises and the victories, the journey and discoveries all culminating in a proud procession of dignified graduating students whose experiences together forged a bond like no other. Soon today's graduates will become a part of a fast growing network united as one single driving force mapping our future. A study of their demographics reveal a common thread that binds them all: The desire and ability to be socially acknowledged being connected to a much wider circle of community than the previous generation could ever have imagined. But what is most characteristic of this generation is the truth and honesty it's ultra-social exposition demands. 1. The acquisition of data from online genealogy research has been phenomenal, enabling us to find our family's past and our place in history more readily. 2. We can rank and tally family reunion surveys much easier. 3. We can get a quick overview of invitation responders using a social enabled RSVP process. 4. We can learn the interests of family members using just one data table. 5. We can hold video conference with committee members and vendors and display possible reunion locations and share charts and forms in real time. Reunion Music Lists: Creating a music list is no longer a matter of guess work and personal taste. 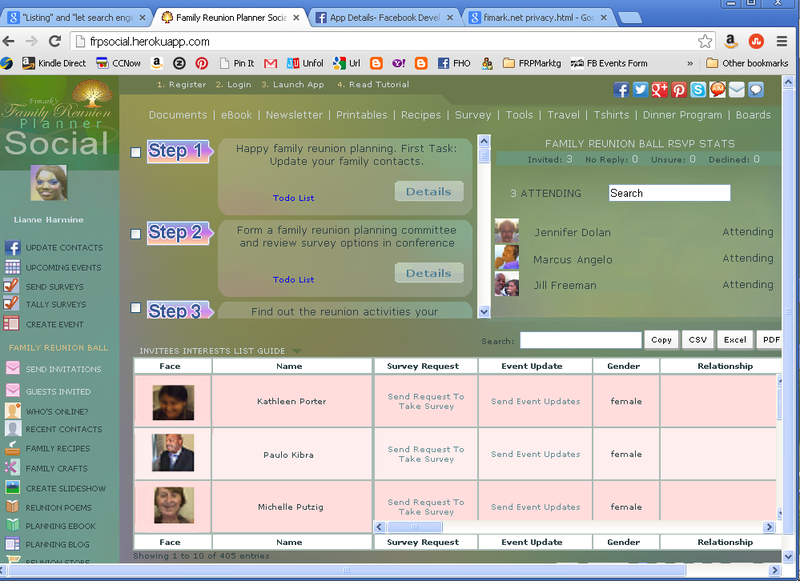 Look over the Invitees Interest List feature in Fimark's Family Reunion Planner Social interface and find each members music list in one table. Choose songs they love and please just about everyone. Reunion Gifts and Awards: Gift giving could not be easier. Look over the Invitees Interest List and find lists of books and movies. Give a gift based on the franchises of the list. Reunion Activities: Looking for ideas for reunion activities? 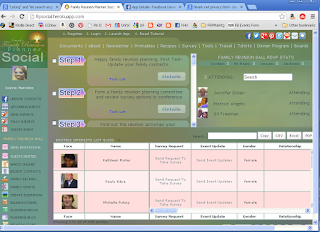 Using the Invitees Interest List find and focus on the TV game shows, hobbies and sports listed by each member. You'll find fun fascinating ideas in no time at all.